2. Squeeze the juice from one mandarin and half a lime. Stir in enough sugar to make a light syrup (about 2 – 3 tbsp) and add the shredded peel to this. 3. Peel the skin from the rest of the mandarins and with a sharp knife, cut off any bits of remaining white pith. Cut mandarins into segments, discarding the membranes. 4. 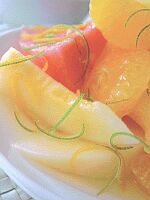 Combine the melons and mandarins in a serving bowl and drizzle the syrup over. Serve cold.